Today is Groundhog Day and Punxsutawney Phil saw his shadow this morning, which means that there will be at least another six weeks left of brash winter, so get ready for a blustery, windy, cold and delightful winter’s end. Today of all days, it really does feel like Groundhog Day, which was also so expertly defined in the comedy film “Groundhog Day” starring Bill Murray. Yes, a comedy classic which poked fun at the genius idea of what would happen to a man, if he was stuck in the same day, over and over again, inside the bane of a boring life routine on actual Groundhog Day in Punxsutawney, PA, on Gobbler’s Knob, reporting on the weather, with his name even being the same name as the Groundhog himself, in “Phil”, “Phil Connors” played by Bill Murray. The 1993 film is the epitome of a comedy classic and we can see why this day of all days is called “Groundhog Day”. A great tradition from Pennsylvania, which reflects the prediction of the weather by a prognosticating groundhog of an early Spring, every year, on February 2nd. So, clearly there won’t be an early spring this year and we realize this when we just open our windows and watch over the grey clouds up above. 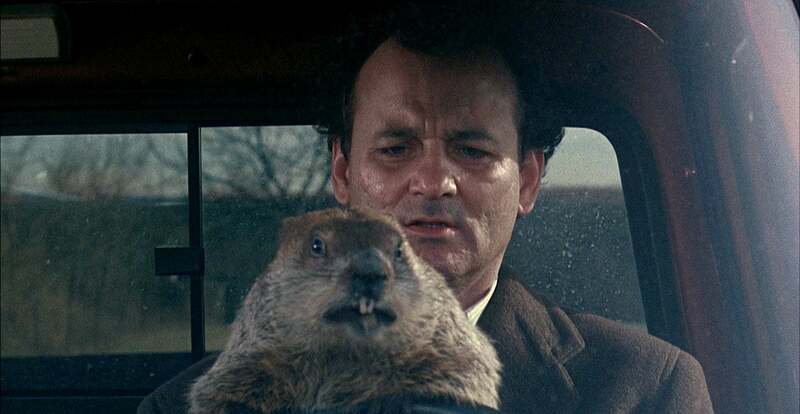 When every day is the same, this has become the popular culture joke of the term “Groundhog Day” and in the hilarious film that’s co-written and directed by the late Harold Ramis, that’s exactly what happens, the same day, over and over again, which is why the film reverberates so well with audiences. Bill Murray goes through a range of personalities in having to re-live the same day, over and over again, which truly brings the best out of Bill Murray’s dry comedy at all times . So, Happy Groundhog Day to all of you out there and enjoy the rest of the long winter. The Groundhog is most definitely in the air today. Somebody needs to stop him.